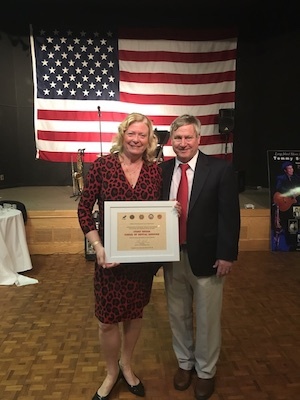 April 2018 - Stony Brook School of Dental Medicine (SDM) was honored on Saturday, April 28th by The Coalition of Fraternal and Veteran Organizations (CFVO) for its "extraordinary service to our veterans," including the provision of discounted services in its Dental Care Center to veterans and Gold Star parents. "It was our privilege to have Stony Brook School of Dental Medicine as our honored guest this year," said Tom Kuhn, CFVO Committee Chairman and veteran of the United States Navy. "We feel it is important to show our gratitude and send a message to the community of our appreciation." In 2017, SDM's Dental Care Center saw over 9,000 veteran and Gold Star parent patient visits for discounted dental services including general dentistry, crowns and bridges, dentures, and certain therapies and surgeries. SDM has also provided oral health care services to the residents and Adult Day Health Care members of Long Island State Veterans home for over two decades. The CFVO's mission of assisting veterans in need through community engagement has created a natural relationship between the CFVO and the SDM. In 2017, the CFVO contributed $11,500 in financial assistance to 13 veterans for necessary dental care within the SDM's Dental Care Center. "I am so proud of our relationship with our veterans and the Coalition," said Mary Mehmel, Patient Care Services Coordinator at SDM's Dental Care Center. "Receiving this honor on behalf of the School of Dental Medicine brought tears to my eyes. There have been few prouder moments in my life."